This is the first book I have read by this author and I really enjoyed the story. I loved Taylor, even though he was supposed to be the a-hole. Sietta in my head was older, in the book he is only 22, but for some reason my mind kept wanting to think he was older than that, don’t ask me why though. I loved the bond between twins, Taylor and Clay, which you could feel through the entire book. I also loved all the secondary characters as well. The banter back and forth was nice and it made me feel like I was there in the story and experiencing everything as it happened. I will say Taylor’s little niece stole the show, she was just adorable! I really hope the author decides to make this a series, I would love to know more about all the other characters that were in this book. This story of a slightly insane Australian police riot squad will appeal to fans of AE Via, Abigail Roux, and Charlie Cochet. Full of testosterone, explosions, and dark humour, this may not be a terribly realistic police procedural – but it is a highly entertaining read. This is Taylor’s story. An enormous, blonde Viking lookalike, he works with his twin brother on the riot squad. At the start of the story, he finds himself policing a party on a cruise boat where he meets Sietta, a rich boy in more trouble than Taylor can initially understand. Taylor’s team helps keep Sietta and his little brother safe while they take down his corrupt and evil family and their political allies. From a gun fight at a family barbeque to car chases, kidnapping, shootouts, and explosions, this is a fast paced and exciting action story. As well as the usual camaraderie between riot squad team mates, this book explores the relationships between the members of Taylor’s large and slightly eccentric family. I loved the banter between siblings and colleagues in this story almost as much as I loved the over-the-top action sequences. The chemistry between Sietta and Taylor is hot and I loved the relationship between Taylor and his twin, Clayton. This is a fun, exciting, and easy read. The Australian setting is novel and the characters are well developed and immensely likeable. This book could easily be the start of a fantastic series – I’d love to read about the other Jameson siblings and the other members of the riot squad. This author is new to me, but I’m excited to read more of her work. 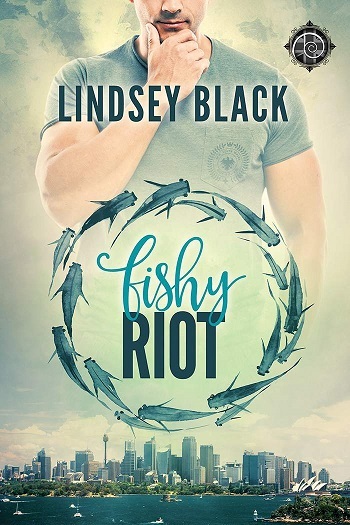 Reviewers on the Wicked Reads Review Team were provided a free copy of Fishy Riot by Lindsey Black to read and review.